Toronto, Ont. 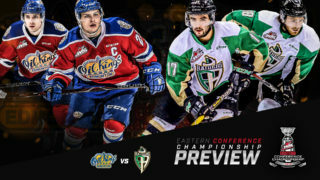 – The Canadian Hockey League today announced the week four edition of the Kia CHL Top-10 Rankings for the 2018-19 season. The weekly rankings of the CHL’s Top-10 teams are selected by a panel of National Hockey League scouts. 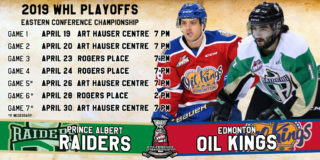 Rising to the second spot on this week’s rankings were the Prince Albert Raiders, who maintained the top record in the Western Hockey League with three wins on a four-game road trip through Alberta. 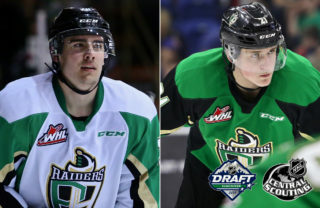 Starting against the Medicine Hat Tigers last Wednesday with a 5-1 win, the Raiders earned a similar 5-1 result against the Lethbridge Hurricanes Friday. The Raiders finally met their match last Saturday, falling in a tight 4-3 decision to the Red Deer Rebels. That defeat was quickly forgotten though with a 4-0 shutout of the Calgary Hitmen Monday. 19-year-old forward Brett Leason has been the surprise of the 2018-19 WHL Regular Season, posting 17 points (6G-11A) in nine games to tie for the WHL’s scoring lead. Still a perfect 3-0-0-0 on home ice, the Raiders will return to the Art Hauser Centre on Saturday, October 13 (7:00 p.m. MT) to host the Rebels. This is the highest the Raiders have been in the CHL Top 10 since October 2, 2013 when they were also second in the rankings. Also rising this week were the 6-0-0-0 Victoria Royals, the only team in the CHL to have yet to suffer a loss of any kind. The now fourth-seeded Royals’ weekend featured a pair of one-goal road victories. Friday, the Royals downed the Kelowna Rockets by a 4-3 score, then earned a 2-1 result over the Kamloops Blazers the following night. 20-year-old goaltender Griffen Outhouse has been a major reason for the team’s success early on, posting a 6-0-0-0 record, 1.85 goals-against-average and a 0.944 save percentage. The Likely, B.C. product is now just seven wins away from 100 for his WHL career. The Royals will renew their rivalry with the Vancouver Giants this coming weekend at home, beginning Saturday, October 13 (7:05 p.m. MT). 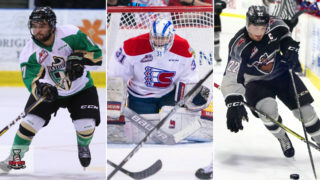 One of six new entrants to the Kia CHL Top 10 Rankings this week, the Vancouver Giants returned to the list in spot seven this week. Like the Royals, the Giants’ week began with a victory over the Rockets, coming in a 5-0 result Wednesday. Heading up to the northern part of the province this past weekend, the Giants scored 3-0 and 3-2 victories over the Prince George Cougars. Trent Miner was a star for the Giants, recording a pair of wins, sporting a 1.00 GAA, and stopping 54 of 56 shots for a 0.964 SV% while picking up his first career WHL shutout last Wednesday. For his efforts, Miner was named the WHL Eli Wilson Goaltending Goaltender of the Week and Vaughn CHL Goaltender of the Week. Before heading to Vancouver Island to battle the Royals this weekend, the Giants will play host to the Kamloops Blazers on Friday, October 12 (7:30 p.m. PT). Earning honourable mentions this week in the Kia CHL Top 10 Rankings were the Brandon Wheat Kings and Saskatoon Blades. The Wheat Kings took three of four points from their weekend road trip to Saskatchewan, going down to a 3-2 defeat in overtime against the Moose Jaw Warriors before unleashing their offence in a 7-3 result over the Regina Pats. Wheat Kings captain Stelio Mattheos (Carolina Hurricanes) leads the team with nine points (5G-4A) in five games. Still a perfect 2-0-0-0 at home, the Wheat Kings will open up a five-game home stand Friday, October 12 (7:30 p.m. CT) when the Warriors make their second trip of the season to Manitoba. Finishing off their Alberta road trip with three straight wins were the Blades. 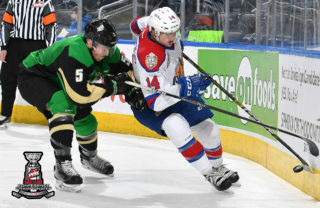 The Blades put an end to the Edmonton Oil Kings’ perfect record with a 5-3 result last Wednesday before earning a 3-0 win over the Calgary Hitmen and a 3-2 shootout win over the Lethbridge Hurricanes. 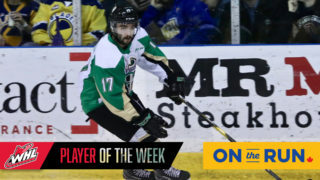 20-year-old defenceman Dawson Davidson posted eight points (1G-7A) in four games to earn WHL On the Run Player of the Week and CHL Player of the Week honours. The Blades are back in action Friday, playing host to the Rebels on Friday, October 12 (7:00 p.m. MT).